To be clear, digitization and digital preservation are not the same thing. 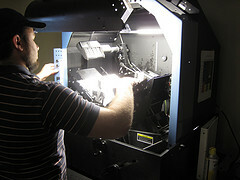 Digitization is the process of making digital copies of physical items. Digital preservation refers to the activities associated with maintaining the viability of, and access to, digital files over time. Thus, the activities of digitization will result in things that can be (need to be?) included in a digital preservation project. I like to think about all of the large scale book scanning that is happening. Massive amounts of digital files are being created from physical books. If these files aren’t taken care of properly, then over time they will become unusable…and all the news coverage of the Google Books settlement seems like a laughable waste of time. This semester, I’m taking a course specifically on Digitization. One of the first questions posed to us was whether or not a physical item (book, document, etc.) that has been digitized can be discarded. Now, I am aware of the intrinsic value that a book hand-printed in the 1500s has, but in my response, I chose to focus on the intellectual (or informational) content. This question made me think about how intricately tied digitized projects should be to digital preservation programs. Why would we risk the total loss of an item’s content if we rely on a digital version of it that is not receiving any stewardship after the physical copy has been tossed? So here are my conditions for tossing a physical copy once it’s been digitized. The digitized copy should be of preservation quality, meeting (what seems to be) the non-standardized requirements of 600+dpi, TIFF file format, etc. The organization charged with keeping the digital file of the digitized item should have a solid and reliable digital preservation program in place. In a successful digital preservation program, the issues related to file format obsolescence, file corruption, and crashed hard drives will be nullified, as the program should account for these disasters ahead of time and be ready with plans to prevent such events. Under this condition, it is safe to assume the analog copy would no longer need to be retained since its informational content is safe in a digital format. Access to the digitized copy must be equal to or greater than the access that was allowed with the physical copy. Preferably, access should be increased, as the new format enables more avenues of access, by nature. As Oya (2007) points out, the investments made in large scale digitization initiatives to aggregate and store digitized collections are huge. “Such investments will be more worthwhile if discovery, access, and delivery are given equal emphasis.” The argument could be made that increased access to content is as much of a justification for digitization as are any reasons associated with preservation of the content of the physical item. Finally, it must be determined that the physical copy of a digitized item has no other value than what can be conveyed through its digital copy. If the physical item is valuable for more than its informational content, then perhaps discarding it after it has been digitized is not a reasonable option. Rieger, Oya, Preservation in the Age of Large-Scale Digitization (DRAFT). Washington, DC: Council on Library and Information Resources, 2007. http://www.clir.org/pubs/abstract/pub141abst.html. Book scanning photo by cogdogblog on Flickr, Creative Commons Attribution 2.0 Generic license. I like all of your criteria for when a physical copy can be discarded, but at this point an archival repository or library would still need to take a long look at their patron-base before shifting significant materials to a digital-only format. While digital use is certainly going to continue to go up and up, there is still a lag in technical understanding and available hardware amongst some researchers and faculty. Unless reference librarians want to spend a lot of time walking users through digital access, it might be handy to keep print copies on hand…at least for a couple more years. Right now I’m involved in digitizing the image collections of the California Academy of Sciences, and at this point in time we’re not even considering discarding any physical copies, even of files we’ve verified to have scanned at CDL standards, cataloged carefully and imported into our digital management system. It’s just not seen as being worth the risk, should something happen to our software and servers. Thanks so much for sharing your process. You make an excellent point about considering the needs of the intended users prior to making any permanent shift in how materials can be accessed. Especially in an institutionally-based repository situation like yours, I’m sure it is critical to make sure that the creators and users of the material can still interact with it in the ways that they want to! Replacing a physical item with a digital version is a big, weighty decision, and there are certainly lots of factors to consider. Maybe total replacement isn’t always the best option given the environmental factors that can influence user needs related to access or format authenticity.